It is no secret that the Jeep brand has some big changes coming over the next few years but the recently published 2012 business plan update from the Chrysler Group shows even more than many were expecting – although the timing of these new models has changed from what was originally rumored. The catch to the product plan announcement is that the chart shows when new models are coming, which company will build them and how the timing relates to the previous business plan. The new Jeep updates begin in 2013 with the refreshed Compass and Grand Cherokee that we saw at the 2013 North American International Auto Show but there is also a new model listed as a 2013 debut. This SUV is named D-SUV by the Chrysler documents and we expect that to be the replacement for the Jeep Liberty – a vehicle which is expected to bring back the name Cherokee. This 2013 new model debut is to be a Chrysler built vehicle so it will likely be the small SUV that we have seen running around this area with a very Alfa Romeo-based design. It has been largely rumored that this mystery SUV frequently seen around Chrysler’s Chelsea Proving Grounds will serve as the successor to the Liberty with a chassis design that will be shared with the new Dodge Dart. Should that be the case, the new Cherokee/Liberty will likely be built alongside the Dart in Belvidere Illinois; the same plant that is already building the Jeep Compass and Patriot. In 2014, there is only one change expected for the Jeep brand and that will come in the form of a new model debut that will be Fiat-built. It has long been rumored that Chrysler plans to remove the Jeep Compass since it is essentially the same vehicle as the Jeep Patriot. The Patriot is entering its 7th model year so it is past due for a refresh and it is a possibility that the next generation Patriot (should they stick with that name) will be built in a Fiat plant. Then again, the company could kill off the Patriot and keep the Compass going. There is also the chance that this 2014 debut will be a new subcompact SUV that would feature European styling and an overseas build location that would compete with the likes of the BMW X1. The chart leads us to believe that 2015 will bring about two new model debuts of Chrysler built products with one of those vehicles having been moved to 2015 from 2013. It was expected that the new Jeep Grand Wagoneer would be introduced in 2013, offering more cargo and seating space than the current Grand Cherokee. 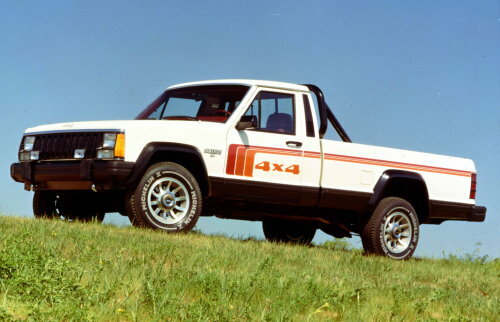 One of these new 2015 debuts will likely be the Grand Wagoneer while the other introduction could be anything from a new compact SUV to the Jeep branded pickup based on the Wrangler that the market has been begging for since the company began showing off design study Wrangler pickups. Finally, 2016 should see two new models built by Chrysler along with a refresh. That far out, the two new models are anyone’s guess but these could bring about those rumored vehicles that the prior two years had failed to touch on including the new compact SUV, the new Compass/Patriot, the Grand Wagoneer, a Wrangler pickup or even a solid top Wrangler. This is all very vague with much of what we believe being based on rumors and common sense but it is clear that the Chrysler Group has no intention to let the popular Jeep lineup go stale over the next few years. As some of these vehicles are unveiled over the next 18 – 23 months, we will have a much clearer idea of what is coming from the Trail Rated Jeep lineup.